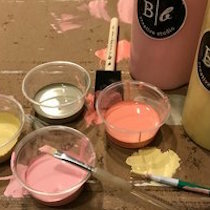 WE TRIED IT AND WE LIKED IT… Board & Brush! 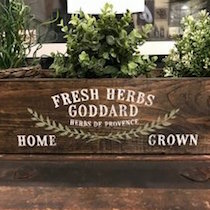 If you’ve strolled along Deer Street in downtown Portsmouth over the last month, you may have noticed a beautiful living room-esque space with bright, inviting lights, and eye-catching, farmhouse-chic signs that dazzle the walls. 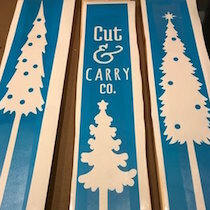 The newest business on Deer Street is called Board & Brush, and we had the opportunity to experience this hands-on, DIY personalized wood sign workshop the other week! Here’s why it’s “all the rage” in our books! 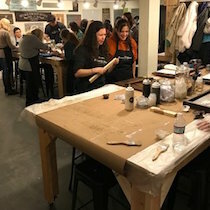 Upon entering Board & Brush on a brisk Friday night, we were welcomed by the friendly faces of mother-daughter owners Lori Goddard and Brittny Daly. 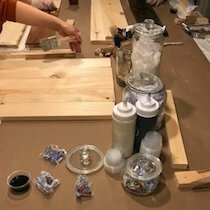 We frolicked to our table, where the project we had selected (when we pre-registered online in advance), was perfectly set up with all of the materials we needed. 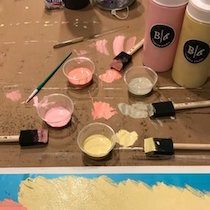 Each participant in the 25-person class had the opportunity to select any sign to make from a variety of choices in Board & Brush’s online gallery of 100+ designs. 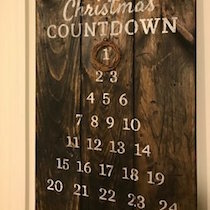 One woman in our class made an advent calendar, while others made personalized signs with their family names. The design options are endless! 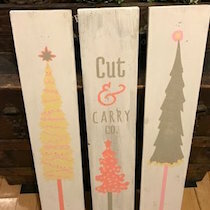 All Board & Brush classes last two and a half to three hours, and in that time, you are able to create a beautiful piece of art for your home. Many helpers jump from table to table, so you feel like you have your own personal assistant. If you’re meticilous, the team is there to assist and ensure that your piece is magazine-worthy when completed. If lean towards free-form (Guilty! ), they are very supportive of you taking creative risks with your project. Here’s what we did to transform our raw materials into what is now a beautiful accent for our home. 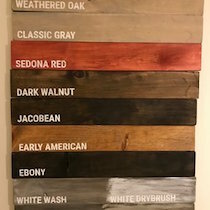 Stained and painted our wood in the colors of our choice. 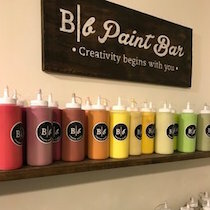 Added our creative spin with colors galore!! Listening to music and chatting with table mates throughout the night made this experience even more memorable. 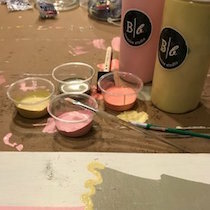 Board & Brush is BYOB, which adds to the festivity for a ladies’ night, holiday party, or just because! 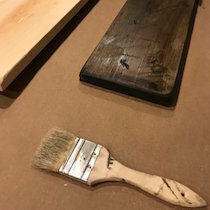 After attending this class, we’re already excited to return and create a brand new piece! Perhaps for a Christmas, Valentine’s Day or Wedding Gift?? Thank you, Lori and Brittny, for choosing Portsmouth for your Board & Brush location — we’re SO excited you’re here! !